The mighty Defiant in Marengo, Illinois last summer. This isn’t about my adventure. It’s about Dave’s Adventure. See, Dave is this guy in a mid-sized older motorhome, a real nice guy just out to see what RVing is all about, same as me. He was parked directly in back of my TT, and the photo above doesn’t show that because it was taken just before he arrived. Otherwise, it’d be in the photo because it was no more than ten feet away. There were a few trees and a powerline close by, too. I left Sept 3rd to head for the Bonneville Salt Flats, and he stayed behind for awhile. “…Looks like you have had your trials and tribulations but have succeeded in your quest so far. As for me, since you left I have had my own trials and tribulations. First off, shortly after you left I took a direct lightning strike on my camper. I heard the boom at the same time as I saw the flash. It was around 6:30am and I had just gone back to bed after using the bathroom. I actually saw a plasma ball the size of a manhole cover form in the living room area. It was a light orange color and was undulating. It only lasted a few seconds and once it disappeared I went back to sleep. When I awoke I found I had no DC power but I had AC power. I switched a few lights on and off and the power came back on. I can imagine, and I’m glad I missed that particular storm! It would certainly have messed up my world. But how did it affect Dave? Months later, he was still finding troubled equipment, like the automatic levelers not working. His thought was not to give up after all, but to trade in his rig for another. See? Once you start this kind of thing, it’s hard to consider giving it up. Still, I prefer my style of adventure, like going to unfamiliar areas, than Dave’s, which is apparently to draw lightning strikes. Thus, I will look forward to seeing him again one day…but I’ll probably ask him to set up his camp “over there” outside a safe perimeter! I hope Dave is able to pursue the RV dream Doug. Please keeps us updated. Life is a trip. Buddha had it right when he started his teachings off with suffering. hahaha. I hope things work out for Dave. I hope karma smiles on you both. Thanks, JR. I suspect that mobile living is one of those things that Dave doesn’t want to regret not doing to his satisfaction, when he looks back on his life. I can understand that. Doug, did I tell you that you are a funny funny man??? Well, not in this particular post, until now, Swankster! I count myself fortunate that you so appreciate my warpy sense of humor. I’d hate to think of fixing all the electronic stuff on my rv. The expense would be pretty high I’m guessing. You got that right, Papa! It would be bad enough for a trailer, but a motorhome has so much more opportunity for fried electrical things. I talked to a guy who was in a Coast Guard C-130 that took a lighting strike on the nose, he said a ball of lightning came out of the wall in front of him, zipped up the middle of the airplane and out the back. There was a hole in the ray dome (front) and that’s all the damage we could find. There was a couple at Adventureland last summer who had a lighting strike, their insurance covered it. Wow, Rob. Just make sure you stay on the hearing end of those kinds of stories. Wouldn’t want to be like Dave and have a new one to tell, firsthand! We had a strike in a house once that fried our computer’s motherboard. Sure don’t ever want to have one in my RV. Glad Dave himself is OK, though. I’ll say! You know, Linda, I realized yesterday that I’ve been researching 102″ whip antennas for my CB. Then I thought of Dave’s experience, and downsized. Is there such a thing as a lightning rod for a TT? If not, it doesn’t seem it would be too hard to rig one up — though it would likely be one of those things you set up and dismantle with every camp. Glad you’re still around to talk about it! 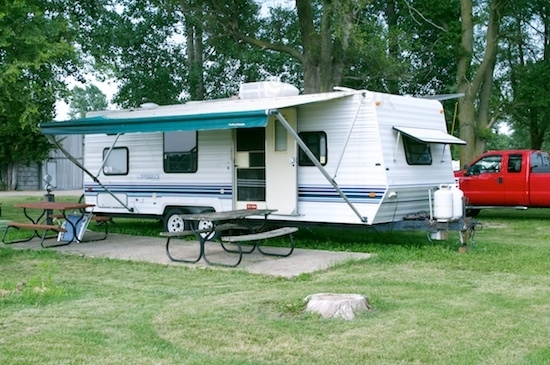 I’m not aware of a rod setup for an RV, and I’m sure the industry would be hesitant to offer one as it would be a reminder of risk while RVing – a no-no. I suspect the only complicator to a very quick deployment and takedown would be making provision for high winds. I’d also assume (ignorance can be a wonderful thing) that it would be best to deploy it separately and away from the RV and tow vehicle, as a kind of lure.